How to let your bridal party look chic without breaking the bank. For a bride planning a wedding, nothing is as important as getting all of the details right on her special day. Cake, flowers, dress, venue- as much of a pain as it can be to plan, it's all worth it when it comes together in a celebration of love and her and her husband's new life together. Unfortunately, not every bride has an unlimited budget, but nobody wants to sacrifice their sense of style to their pocketbook. Luckily, if you play your cards right, you might not have to. For starters, the trend of allowing all of the bridesmaids to wear different dresses can be a huge help in this regard, since your bridal party may actually already have the perfect dresses in their closets. Of course, it's up to the bride to choose a feel for her wedding (formal? Semi-formal? Outdoor?) and the colors, but allowing the bridal party to take this information and select their own outfits often works out stupendously. 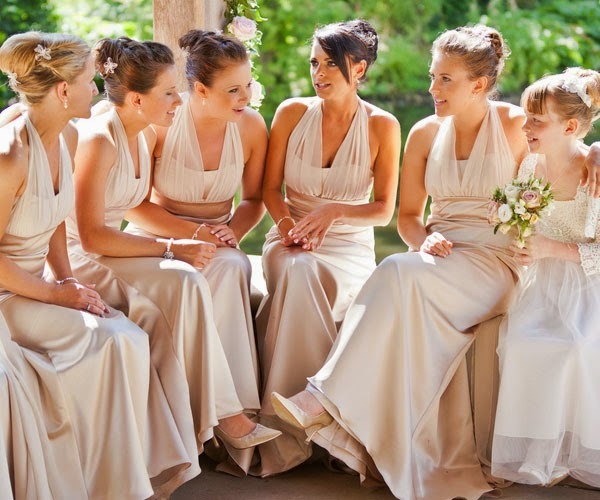 While some brides may want the coordinated look of matching bridesmaids, there's no denying the sharpness and style of a bridal party in dresses that suit them individually, too. Think about when you look back on your wedding photos- what will look better to you, personally? A neat row of matching frocks, (though the chosen style may not exactly work for the tallest bridesmaid, or the shortest one, or the skinniest one, or the heaviest one...) or a group of girls that may not be dressed identically, but are wearing styles that fit well, suit them, and suit your wedding (well, except for maybe your cousin, who didn't get the memo and wore magenta instead of royal blue)? Another thing to consider is selecting off-the-rack dresses from dress shops, or even websites in the UK or abroad. While they may not technically be "real" bridesmaid dresses, there are many cuts and colors of regular party or cocktail dresses that would suit a wedding party just fine, and some online retailers might even be willing to offer you a discount for buying multiples to dress your entire bridal party. Of course, many of these will be knee-length styles, making them more suitable for a semi-formal or even beach wedding than a full-on formal affair. Picking figure-friendly fabrics also can eliminate the need for fittings and alterations. 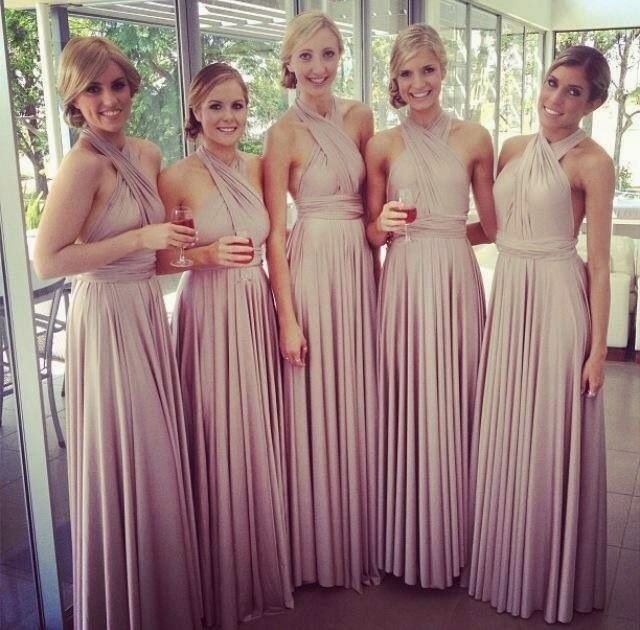 Buying bridesmaid dresses like this has the advantage of saving you money, while also allowing both traditional brides to have a fully-matching wedding party, or, if the design comes in different colors, more new-school brides to have a coordinating "rainbow wedding." If you're a savvy shopper, there's no reason why your style should have to suffer during an economic downturn. By playing a little bit with the idea of how you want your bridal party to look, you can come up with a cohesive, stylish, modern-looking wedding, without having to sacrifice the budget for any other parts of your special day.